© Eren et al. ; Licensee Bentham Open. We aimed to investigate the relation between serum inflammatory markers, 25OHvit-D3 and oxidative stress markers, namely paraoxonase1-arylesterase (PON1-ARE), total antioxidant status (TAS) and total oxidant status (TOS) in 30 male patients with ST–elevation myocardial infarction(STEMI) . There was negative correlation between tumor necrosis factor alpha and ARE; positive correlations between serum amyloid A(SAA) and oxidative stress index, SAA and TOS, 25OHvit-D3 and ARE. There was no statistically significant correlation between inflammation makers, oxidative stress markers and Gensini score. The main finding of our study was the tendency of inflammation markers, and oxidative stress markers, to change in relatively clear opposite directions in STEMI. Keywords: : Acute coronary syndrome, calcidiol, HDL, IL-6, IL-10, inflammation markers, oxidative stress, paraoxonase, serum amyloid A, vitamin D.
Previous studies have suggested that vitamin D deficiency might contribute to the pathogenesis of myocardial infarction . However, no data are available on the association of paraoxonase activity -a HDL-associated enzyme and the development of ST-elevation myocardial infarction (STEMI). Thus, we investigated whether serum vitamin D3 is inversely associated with PON1 enzyme activity in STEMI patients. In animal models of inflammatory diseases, serum activity of Paraoxonase (PON1) is diminished. Taking into account the anti-inflammatory and antioxidant properties of PON1, decrease in the enzyme’s activity might exacerbate the inflammation and oxidative stress which accompany myocardial infarction . Paraoxonase – so named because of its ability to hydrolyse the toxic metabolite of parathion, paraoxon – was also shown early after its identification to manifest arylesterase (ARE) activity. Hence, research on PON1 function was focused on trying to distinguish the native or “ancestral” function of this enzyme from all other secondary or “adapted” functions . Although the preferred endogenous substrate of PON1 remains unknown, lactones (especially Homocysteine-thiolactone) comprise one possible candidate class [3-5]. More than 95% of PON1 is associated with HDL particles in the circulation. So, PON1 exerts a protective effect against oxidative damage of cells and lipoproteins and modulates the susceptibility of HDL and LDL to atherogenic modifications such as homocysteinylation [5,6]. Vitamin D has potential ameliorating effects on the development of cardiovascular events by several mechanisms, but the molecular mechanisms of this association remain incompletely understood. Vitamin D is a prohormone obtained from dietary sources or produced from UV activation in the skin. It functions through a specific receptor (VDR), and as a transcription factor, which directly or indirectly controls more than two-hundred heterogeneous genes including the genes for the regulation of cellular differentiation, proliferation, and angiogenesis [6-8]. The VDR is nearly immanently expressed, and nearly all the cells respond to vitamin D exposure; about 3% of the human genome is organized directly or indirectly by the vitamin D endocrine system [9-11]. Furthermore, it has been shown that cardiac myocytes and fibroblasts express the enzymes alpha-l hydroxylase (1α-OHlase) and 24-hydroxylase. Considering that the conversion of 25-dihydroxycholecalciferol(calcidiol), to 1,25-dihydroxycholecalciferol(calcitriol), the active form of vitamin D3 by 1α-OHlase in extrarenal tissues, is mainly dependent on substrate availability, this latter finding suggests that the concentrations of circulating calcidiol levels might be a significant determinant of vitamin D3 effects in the myocardium. Homo-cysteine-thiolactone), the active form of vitamin D3 by 1α-OHlase in extrarenal tissues, is mainly dependent on substrate availability, this latter finding suggests that the concentrations of circulating calcidiol levels might be a significant determinant of vitamin D3 effects in the myocardium. Vitamin D3 could also be associated with cardiovascular disease by down-regulating tumor necrosis factor-alpha (TNF-α) and interleukin IL-6 and up-regulating interleukin IL-10. Today, serum amyloid A (SAA) and C-reactive protein (CRP) are two commonly used acute-phase markers. Like CRP, SAA is synthesized in the liver in response to infection, inflammation, injury, or stress [1,12,13]. This study was designed to determine if the activity of PON1, an antioxidant enzyme that works as a negative acute phase reactant, is correlated with inflammatory markers such as CRP, SAA, IL-6, TNF–α, IL-10 and hypovitaminosis D in STEMI patients receiving standard treatments. We evaluated 30 male consecutive patients with acute STEMI who were admitted to our hospital with a chest pain and underwent urgent cardiac catheterization between November-March 2012. The patients had presented symptoms within 12 hours from the onset of disease (typically, chest pain lasting for >30 minutes), ST-segment elevation >2 mm in >2 contiguous electrocardiographic leads or new onset of complete left bundle-branch block, and they had primary PCI (angioplasty and/or stent deployment). Exclusion criteria were: a prior MI, cardiac arrest, a prior coronary artery bypass graft, congestive heart failure, active infections, systemic inflammatory disease, known liver, hematologic, or malignant disease, end-stage renal disease. The presence of obesity, diabetes mellitus, and hypertension was also assessed. Obesity was defined as body mass index (BMI) greater than 27,8 kg/m2 as proposed by the National Institute’s of Health consensus statement. Diabetes was defined as fasting blood glucose >126 mg/dl or diagnosis of diabetes needing diet or drug therapy. Hypertension was defined as resting systolic blood pressure >140 mm Hg and/or diastolic blood pressure>90 mm Hg. All the participants gave written informed consent, and the local ethics committee review board approved the study protocol. The optimal plasma level of calcidiol is commonly said to be 30 ng/ml or above, while levels of 21–29 ng/ml are generally considered as insufficient, and levels below 20 ng/ml are considered as deficient. The term severe deficiency (osteopenic) is commonly used in settings when serum calcidiol levels are less than 10 ng/ml . PCI was performed using the standard percutaneous Judkins technique. The angiographic characteristics, which included lesion location and percentage stenosis, of all coronary lesions in the index coronary angiogram were obtained from reviewing the angiogram according to Gensini scores . All coronary angiographies were performed in the same center. Two experienced cardiologists blinded to the study protocol carried out the angiographic analysis. Blood samples were obtained after an overnight of fasting. Serum samples were then separated from cells by centrifugation at 3000 rpm for 10 min. Lipid parameters and other routine parameters were measured freshly. Remaining serum portions were stored at −80 °C and used to analyze calcidiol, PON1, ARE, total antioxidant status (TAS), total oxidant status (TOS) and inflammatory markers. Blood samples were obtained during the same season. 25OH-D (calcidiol)assay (DiaSorin, Stillwater) was performed by using LIAISON® analyzer, with a direct competitive chemiluminescence immunoassay method. Reagents contain an antibody specific to 25OH-D, which is coated on magnetic particles, and 25OH-D conjugated to an isoluminol derivative and diluted in phosphate buffer. During the first incubation phase, 25OH-D is dissociated from its binding protein, and its interacts with binding sites on the antibody on the solid phase. Then, after the second incubation with the tracer, the unbound material is washed off and starter reagents are added to generate a flash chemiluminescent signal which is measured by a photomultiplier and is inversely related to the 25-OHD concentration. The LIAISON® assay is linear only up to 125 ng/ml of total 25OH-D for unaltered samples. Limit of detection of 3.5 ng/ml and a coefficient of variability ranged from 4.8% to 11.1% 25OH-D assay. PON1 and ARE enzyme activities were measured by using Erel’s method. Fully automated PON1 activity measurement method consists of two different sequential reagents; the first reagent is an appropriate Tris buffer and it also contains calcium ion, which is a cofactor of PON1 enzyme. Linear increase of the absorbance of p -nitrophenol, produced from paraoxon, is followed at kinetic measurement mode. Non-enzymatic hydrolysis of paraoxon was substracted from the total rate of hydrolysis. The molar absorptivity of p-nitrophenol is 18.290 M−1 cm−1 and one unit of paraoxonase activity is equal to 1 mole of paraoxon hydrolyzed per liter per minute at 37 °C. Phenylacetate was used as a substrate to measure the ARE activity. PON1, present in the sample, hydrolyses phenylacetate to its products, which are phenol and acetic acid. The produced phenol is colorimetrically measured via oxidative coupling with 4-aminoantipyrine and potassiumferricyanide. Nonenzymatic hydrolysis of phenyl acetate was subtracted from the total rate of hydrolysis. The molar absorptivity of colored complex is 4000M−1 cm−1 and one unit of arylesterase activity is equal to 1 mmol of phenylacetate hydrolyzed per liter per minute at 37 °C . The TAS of the serum was measured using an automated colorimetric measurement method developed by Erel . In this method, antioxidants in the sample reduce dark blue-green colored 2, 2′-azino-bis(3-ethylbenzthiazoline-6-sulphonic acid) (ABTS) radical to colorless reduced ABTS form. The change of absorbance at 660 nm is related with total antioxidant level of the sample. This method determines the antioxidative effect of the sample against the potent free radical reactions initiated by the produced hydroxyl radical. The results are expressed as micromolar trolox equivalent per liter. The TOS of the plasma was measured using an automated colorimetric measurement method developed by Erel . In this method, oxidants present in the sample oxidize the ferrous ion–chelator complex to ferric ion which makes a colored complex with a chromogen in an acidic medium. The color intensity, which can be measured spectrophotometrically, is related to the total amount of oxidant molecules present in the sample. The results are expressed in terms of micromolar hydrogen peroxide equivalent per liter (μmol H2O2 Equiv./L). The percentage ratio of TOS level to TAS level was accepted as oxidative stress index (OSI) . For calculation, the resulting micromolar unit of TAS was changed to millimoles per liter, and the OSI value was calculated according to the following formula: OSI (arbitrary unit)=TOS (micromolar hydrogen peroxide equivalent per liter)/TAS (micromolar trolox equivalent per liter). The levels of triglycerides (TG), total cholesterol (TC), HDL-cholesterol (HDL-C), LDL-cholesterol (LDL-C) and creatinine were determined by using commercially available assay kits (Abbott) with an autoanalyzer (Architect® c16000, Abbott Diagnostics). TNFα, IL-6, and IL-10 levels were measured using commercially available ELISA kits (DIAsource Immuno Assay S.A, Louvain-la-Neuve, Belgium) (% CV: 6.6; 4.2; 2.8 respectively) and also SAA levels were measured using a commercially available ELISA kit (Uscn life Science Inc. Houston, USA) (%CV: <10). The assays employed the quantitative sandwich enzyme immunoassay technique. To avoid variation within an assay, measurements were performed in duplicate, simultaneously using the same ELISA kit to avoid variation within assay, and in a blind manner. Plasma samples from ACS patients were assayed for high sensitive(hs)CRP with the use of latex-enhanced immunonephelometric assays on a BN II analyzer (Siemens, Dade Behring, Newark, Del, USA). The range of detection for hsCRP was 0.75–1100 mg/L. Statistical analyses were carried out using the statistical software. In normally distributed groups the results were presented with mean and SD, otherwise with medians. Pearson correlation coefficient and Spearman correlation coefficient were used to test the strength of any associations between different variables. P value less than 0.05 was accepted as the significance level. The demographic characteristics, clinical findings, and laboratory data of the STEMI patients are shown in Table 1,2 and Fig. (1). 30 male patients were enrolled for data collection. The mean age was 56±14 years. 33% of patients had diabetes mellitus. Ischemia reperfusion time of the study group was 183±145 minute. The mean Gensini score was 70±38. 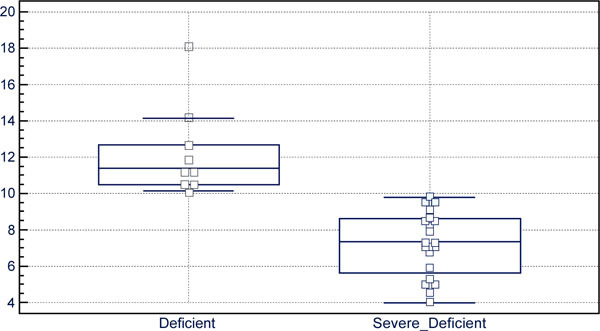 25OHvit-D3 of 10 patients were at the level of deficiency and 20 patients were at the level of severe deficiency (Fig. 2). Serum HDL-C mean was about the lower reference range. Serum creatinine and GFR (MDRD) means were within reference limits. Serum LDL-C, TC and TG means were above optimal. Inflammation and oxidative stress markers of patients with STEMI patients. Mean and reference range of inflammation markers (respectively); SAA (ng/ml): 1200 (<100), hsCRP (mg/L): 35.1 (1-3), IL-10 (pg/ml): 12.3 (0-3.3), IL-6 (pg/ml): 60 (0-50), TNFα (pg/ml): 11.8 (4.6-12.4). Mean±SD of oxidative stress markers; PON1 (U/L): 178.5 ± 118, ARE (kU/L): 160±45, TAS (nmol Trolox/L): 2.2±0.2, TOS (μmol H2O2 Equiv./L): 1.8±4, OSI: 0.7±1.6. Distribution of 25OHvit-D3 in STEMI patients. 10 (33%) patients were deficient and 20 (67%) patients severely deficient [25OHVitamin D3 (ng/ml), mean±SD: 8.9±3, reference range: 30-60]. Clinical and demographic characteristics of patients with STEMI patients. Laboratory data of all patients with STEMI patients. * GFR: Glomerular filtration rate, MDRD:Modification diet in renal disease. Correlation analysis was used to assess inflammation markers, oxidative stress markers and Gensini Score in the patients. There was a negative correlation between TNFα and ARE (r = -0.515; p = 0.003). There was a positive correlation between SAA and OSI (r= 0.34; p=0.04), SAA and TOS (r= 0.358; p=0.03), 25OHvit-D3 and ARE (r=0.38; p=0.03). There was no statistically significant correlation between inflammation makers, oxidative stress markers and Gensini score (Table 3, Fig. 3). There was no statistically significant difference in any parameters (including cholesterol, triglyceride, etc) between 25OHvit-D3 deficient (<30 ng/ml) patients and 25OHvit-D3 severely deficient (<20 ng/ml) patients. Significant correlation of biomarkers in STEMI patients. 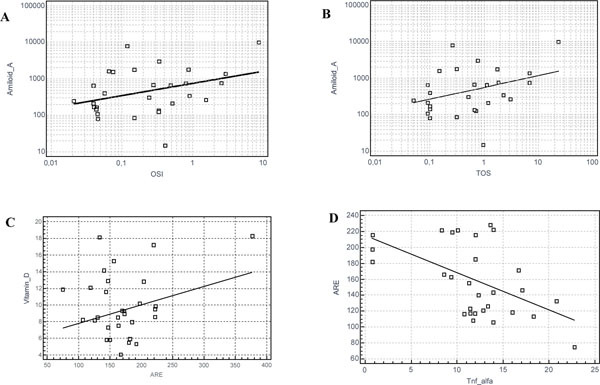 Graphics of significant correlations: (A) Serum Amyloid-A and OSI (r= 0.34; p=0.04); (B) Serum Amyloid-A and TOS (r= 0.358; p=0.03); (C) Vitamin-D and ARE (r=0.38; p=0.03); (D) ARE and TNF-alfa (r = -0.515; p = 0.003). The main finding of our study was that the HDL-associated protein molecules, SAA, an inflammation-related marker, and PON1-arilyesterase, an antioxidant marker, tend to change in clear opposite directions in a disease with inflammation and oxidative stress conditions at the background. In addition, PON1-ARE enzyme activity was inversely associated with the severity of hypovitaminosis D. This study demonstrates - to our knowledge for the first time - that level of 25OHvit-D3 is positively correlated with HDL-associated serum ARE enzyme activity in a patient group of newly diagnosed STEMI with coronary lesions on the angiogram. Several pathways linking vitamin D status with atherogenesis and myocardial infarction risk have been identified in experimental studies [18-21]. Our results also confirmed a high prevalence of vitamin D deficiency in patients with acute myocardial infarction. So, our data are in agreement with the concept that myocardial infarction is a multifactorial and complex disease. Vitamin D has already been shown to down-regulate the renin-angiotensin aldosterone system, proliferation of vascular smooth muscle cells and cardiomyocytes, inflammation, coagulation, vascular calcification, and parathyroid hormone level [18-24]. We also found that lower vitamin D activity was accompanied with decreased levels of a negative acute phase reactant HDL-associated PON1-ARE enzyme activity. Thus, the decrease in 25OHvit-D3 levels may occur as integral part of an oxidative and /or inflammatory response. So, our efforts were focused on how hypovitaminosis D is modulated by inflammation, since inflammation plays an important role in the pathogenesis of acute coronary events. Indeed, HDL may be converted from an anti-inflammatory to a proinflammatory particle when PON1 level or activity associated with HDL is diminished during the acute phase response to hypovitaminosis D [25-27]. Our study describes the 25OHvit-D3 status in newly diagnosed patients with STEMI. It confirms a highly prevalent deficiency of vitamin D in these patients. None of the participants had sufficient levels of 25OHvit-D3 (>30 ng/ml). Previous studies have demonstrated that proper 25OHvit-D3 level was found ranging only in 0-10.6% of investigated acute coronary syndrome patients [1,28,29]. These studies support our observation of a high prevalence of vitamin D deficiency in patients with acute myocardial infarction [30-32]. In our study no statistically-significant correlation between 25OHvit-D3 levels and severity of atherosclerosis in angiography (Gensini Score: median of 70±38) was observed. There is a lack of data concerning this relationship in patients with STEMI . Several large prospective observational or cohort studies have demonstrated that a higher vitamin D status is associated with approximately 50% lower cardiovascular morbidity and mortality risk compared with low vitamin D status [20,22]. A reduction in calcidiol levels is associated with oxidative imbalance and inflammation-linked vascular endothelial dysfunction in older adults. These people mostly live indoors, which means low exposure to sunlight and diminished skin vitamin D synthesis. They also experience problems in food intake that vitamin D supplementation by nutrition is often too low to compensate for reduced dermal production. Age related inadequate gut absorption only worsen the problems relating to hypovitaminosis D in the elderly [33,34]. STEMI patients, at admission, had significantly higher values of inflammatory markers and cytokine levels than reference range, except for TNF α (Table 2). This systemic inflammation at the development of an acute coronary syndrome might alter the HDL components and function. One of the major functions of HDL particles is their ability of anti-inflammatory (SAA) and antioxidative (PON1-ARE) function [35,36]. The relationship between positive acute phase reactant SAA and oxidative stress parameters was also examined in this study. 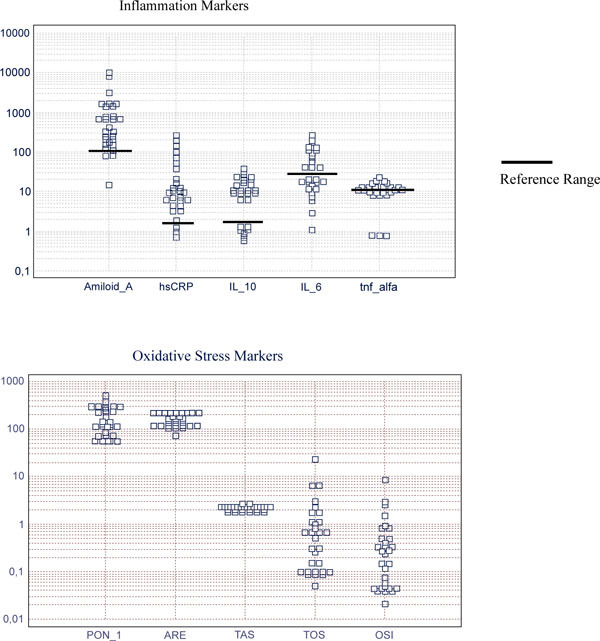 The analysis by Pearson or Spearman correlation showed that oxidative stress parameters in all subjects were associated with OSI and TOS (Table 3). Oxidative stress is an important contributor to STEMI onset among old individuals. Correlated OSI, TOS and SAA levels reflect a positive acute phase reaction and vascular damage related to inflammation in early onset STEMI. It has been documented that inflammatory markers such as SAA are directly involved in the atherosclerotic process and may serve as predictor for the risk of AMI [37-40]. Our study showed that an increase in SAA accompanying the increase in OSI and TOS has been found during the acute inflammation period. However, whether this phenomenon persists in coronary events, a disease related to inflammation, is unknown. Previous studies reported that there was an independent positive correlation between SAA and oxidative stress parameters of cardiac events [41-44]. However, the question of whether this alteration in inflammation response is associated with impairment of oxidative balance requires further research. Our results also demonstrated that patients with STEMI exhibited increased hsCRP levels in circulation. In addition, we found that PON1-ARE enzyme activity was not significantly associated with the level of hsCRP, providing no mechanistic link between inflammation and decreased PON1-ARE enzyme activity in the development of STEMI. As expected, correlation factor in negative acute phase reactant PON1-ARE activity was found to be negative, depending on TNFα in the studied subjects. It has been reported that inflammatory conditions result in PON1 enzymatic activity exhaustion and down regulation of hepatic PON1 mRNA levels [25,26,41]. We further explored the relationship between PON1 activity and the extent of atherosclerosis in angiographically proven coronary artery disease patients. Similar to the previous findings, our previous data showed that PON1 activity was significantly lower in heart patients than healthy subjects. Furthermore, the correlation analysis revealed no correlation between PON1 activity and the severity of myocardial infarction reflected by Gensini score in STEMI patients [1,25]. Besides the sample size, a further limitation of our study was that we could assess 25OHvit-D3 levels only at a single occasion. However, in spite of the seasonal variation in 25OHvit-D3, several large studies have shown acceptable long-term correlations between repeated 25OHvit-D3 measurements that are comparable to those of other biomarkers of cardiac events. Serum 25OHvit-D3 is a negative acute phase reactant, which has implications for acute inflammatory diseases. Also, Waldron et al. reported that serum 25OHvit-D3 is an unreliable biomarker of vitamin D status after acute inflammatory insult. We demonstrated here a very fine tuning of HDL particle in STEMI patients. Two HDL-related proteins with different functions (SAA with anti-inflammatory and PON1-ARE with anti-oxidant functions) showed changes in relatively clear opposite directions. This finding warrants attention in understanding the complex modifications of HDL particularly in coronary disease. We also confirmed the presence of hypovitaminosis D in these patients, suggesting the beneficial application of supportive medications. Apparently, further studies are needed to understand the intense communications between vitamin D, oxidative stress and inflammation. Goleniewska BM, Kacprzak M, Zielinska M. Vitamin D level and extent of coronary stenotic lesions in patients with first acute myocardial infarction Cardiol J 2014; 2(1): 18-23. Eren E, Yilmaz N, Aydin O. Functionally defective high-density lipoprotein and paraoxonase: a couple for endothelial dysfunction in atherosclerosis Cholesterol 2013; 792090. Jiang H, Stabler SP, Allen RH, Maclean KN. Altered expression of apoA-I, apoA-IV and PON-1 activity in CBS deficient homocystinuria in the presence and absence of treatment: possible implications for cardiovascular outcomes Mol Genet Metab 2012; 107(1-2): 55-65. Lakshman MR, Gottipati CS, Narasimhan SJ, Munoz J, Marmillot P, Nylen ES. Inverse correlation of serum paraoxonase and homocysteine thiolactonase activities and antioxidant capacity of high-density lipoprotein with the severity of cardiovascular disease in persons with type 2 diabetes mellitus Metabolism 2006; 55(9): 1201-6. Beltowski J. Protein homocysteinylation: a new mechanism of atherogenesis? Postepy Hig Med Dosw 2005; 59: 392-404. Yilmaz N. Relationship between paraoxonase and homocysteine: crossroads of oxidative diseases Arch Med Sci 2012; 8(1): 138-53. Eren E, Ellidag HY, Cekin Y, Ayoglu RU, Sekercioglu AO, Yilmaz N. Heart valve disease: The role of calcidiol deficiency, elevated parathyroid hormone levels and oxidative stress in mitral and aortic valve insufficiency Redox Rep 2014; 19(1): 34-9. Weng S, Sprague JE, Oh J, et al. Vitamin D deficiency induces high blood pressure and accelerates atherosclerosis in mice PLoS One 2013; 8(1): e54625. Szeto FL, Reardon CA, Yoon D, et al. Vitamin D receptor signaling inhibits atherosclerosis in mice Mol Endocrinol 2012; 26(7): 1091-101. Schnatz PF, Nudy M, O'Sullivan DM, et al. Coronary artery vitamin D receptor expression and plasma concentrations of 25-hydroxy-vitamin D: their association with atherosclerosis Menopause 2012; 19(9): 967-73. Stojanovic OI, Lazovic M, Lazovic M, Vuceljic M. Association between atherosclerosis and osteoporosis, the role of vitamin D Arch Med Sci 2011; 7(2): 179-88. Karakas M, Thorand B, Zierer A, et al. Low levels of serum 25-hydroxyvitamin D are associated with increased risk of myocardial infarction, especially in women: results from the MONICA/KORA Augsburg case-cohort study J Clin Endocrinol Metab 2013; 98(1): 272-80. Chen GL, Liu LW, Xie S, Liu H, Liu YQ, Li YS. High-density lipoprotein associated factors apoA-I and serum amyloid A in Chinese non-diabetic patients with coronary heart disease Chin Med J (Engl) 2010; 123(6): 658-63. Gensini GG. A more meaningful scoring system for determining the severity of coronary heart disease Am J Cardiol 1983; 51: 606. Haagen L, Brock A. A newautomatedmethod for phenotyping arylesterase (E.C.3.1.1.2.) based upon inhibition of enzymatic hydrolisis of 4-nitrophenyl acetate Eur J Clin Chem Clin Biochem 1992; 30: 391-5. Erel O. A novel automated direct measurement method for total antioxidant capacity using a new generationmore stable ABTS radical cation Clin Biochem 2004; 37: 277-85. Erel O. A new automated colorimetric method for measuring total oxidant status Clin Biochem 2005; 38: 1103-11. Kühn T, Kaaks R, Teucher B, et al. Plasma 25-hydroxyvitamin D and its genetic determinants in relation to incident myocardial infarction and stroke in the European prospective investigation into cancer and nutrition (EPIC)-Germany study PLoS One 2013; 8(7): e69080. Gunta SS, Thadhani RI, Mak RH. The effect of vitamin D status on risk factors for cardiovascular disease Nat Rev Nephrol 2013; 9(6): 337-47. Brøndum-Jacobsen P, Benn M, Jensen GB, Nordestgaard BG. 25-hydroxyvitamin D levels and risk of ischemic heart disease, myocardial infarction, and early death: population-based study and meta-analyses of 18 and 17 studies Arterioscler Thromb Vasc Biol 2012; 32(11): 2794-802. Park S, Lee BK. Vitamin D deficiency is an independent risk factor for cardiovascular disease in Koreans aged ≥ 50 years: results from the Korean National Health and Nutrition Examination Survey Nutr Res Pract 2012; 6(2): 162-8. Wang L, Song Y, Manson JE, et al. Circulating 25-hydroxy-vitamin D and risk of cardiovascular disease: a meta-analysis of prospective studies Circ Cardiovasc Qual Outcomes 2012; 5(6): 819-29. Guessous I, Bochud M, Bonny O, Burnier M. Calcium, vitamin D and cardiovascular disease. Kidney. Blood Pres Res 2011; 34(6): 404-17. Zittermann A, Gummert JF. Nonclassical vitamin D action Nutrients 2010; 2(4): 408-25. Zhou C, Cao J, Shang L, et al. Reduced paraoxonase 1 activity as a marker for severe coronary artery disease Dis Markers 2013; 35(2): 97-103. Han L, Xu XJ, Liang XH, Ma J. Association of paraoxonase polymorphisms with carotid artery atherosclerosis in essential hypertension patients Genet Mol Res 2013; 12(4): 5174-85. Kassi E, Adamopoulos C, Basdra EK, Papavassiliou AG. Role of vitamin D in atherosclerosis Circulation 2013; 128(23): 2517-31. Melamed ML, Michos ED, Post W, Astor B. 25-hydroxyvitamin D levels and the risk of mortality in the general population Arch Intern Med 2008; 168: 1629-37. Ng LL, Sandhu JK, Squire IB, Davies JE, Jones DJ. Vitamin D and prognosis in acute myocardial infarction Int J Cardiol 2013; 168(3): 2341-6. Dror Y, Giveon SM, Hoshen M, Feldhamer I, Balicer RD, Feldman BS. Vitamin D levels for preventing acute coronary syndrome and mortality: evidence of a nonlinear association J Clin Endocrinol Metab 2013; 98(5): 2160-7. Correia L, Sodre F, Garcia , et al. Relation of severe deficiency of vitamin d to cardiovascular mortality during acute coronary syndromes Am J Cardiol 2013; 111: 324-7. Grandi NC, Breitling LP, Brenner H. Vitamin D and cardiovascular disease: systematic review and meta-analysis of prospective studies Prev med 2010; 51(3): 228-33. Cabral MA, Borges CN, Maia JM, Aires CA, Bandeira F. Prevalence of vitamin D deficiency during the summer and its relationship with sun exposure and skin phototype in elderly men living in the tropics Clin Interv Aging 2013; 8: 1347-51. Grineva EN, Karonova T, Micheeva E, Belyaeva O, Nikitina IL. Vitamin D deficiency is a risk factor for obesity and diabetes type 2 in women at late reproductive age Aging (Albany NY) 2013; 5(7): 575-81. Eren E, Yilmaz N, Aydin O. High density lipoprotein and it's dysfunction Open Biochem J 2012; 6: 78-93. Korita I, Bulo A, Langlois MR, Verhoye E, Blaton V. Serum amyloid A is independently related to apolipoprotein A-I but not to HDL-cholesterol in patients with angina pectoris Clin Biochem 2013; 46(16-17): 1660-3. Holzer M, Trieb M, Konya V, Wadsack C, Heinemann A, Marsche G. Aging affects high-density lipoprotein composition and function Biochem Biophys Acta 2013; 1831(9): 1442-8. Di Stefano R, Di Bello V, Barsotti MC, et al. Inflammatory markers and cardiac function in acute coronary syndrome: difference in ST-segment elevation myocardial infarction (STEMI) and in non-STEMI models Biomed Pharmacother 2009; 63(10): 773-80. Kotani K, Yamada T, Gugliucci A. Paired measurements of paraoxonase 1 and serum amyloid a as useful disease markers Biomed Res Int 2013; 481437. Yilmaz N, Simsek N, Aydin O, et al. Decreased paraoxonase 1, arylesterase enzyme activity, and enhanced oxidative stress in patients with mitral and aortic valve insufficiency Clin Lab 2013; 59(5-6): 597-604. Hua S, Song C, Geczy CL, Freedman SB, Witting PK. A role for acute-phase serum amyloid A and high-density lipoprotein in oxidative stress, endothelial dysfunction and atherosclerosis Redox Rep 2009; 14(5): 187-96. Wang X, Chai H, Wang Z, Lin PH, Yao Q, Chen C. Serum amyloid A induces endothelial dysfunction in porcine coronary arteries and human coronary artery endothelial cells Am J Physiol Heart Circ Physiol 2008; 295(6): H2399-408. Waldron JL, Ashby HL, Cornes MP, Bechervaise J, Razavi C, Thomas OL. Vitamin D: a negative acute phase reactant J Clin Pathol 2013; 66(7): 620-2.